Click here to view and interact with the DICOM images for Figure 2 in the Exa-PACS zero foot print viewer provided by Viztek. A 69-year-old female presents to her physician with complaint of 30 pounds unintentional weight loss and abdominal fullness, for which the physician ordered a CT chest/abdomen/pelvis and screening mammogram. At mammography, a 5 cm area of architectural distortion was identified in the left breast at 11:00 posterior depth. The architectural distortion was better visualized on digital breast tomosynthesis (DBT) and persisted on diagnostic imaging. Ultrasound demonstrated an ill-defined hypoechoic mass that corresponded to the area of the mammographic abnormality in addition to abnormal enlarged lymph nodes in the left axilla. US-guided biopsy of the left breast mass and abnormal axillary lymph node revealed pathology consistent with infiltrating lobular carcinoma, not otherwise specified (ILC NOS) and metastatic disease from a breast primary, respectively. The CT showed marked wall thickening of the stomach, small bowel, bladder in addition to moderate ascites. Biopsies from the gastroesophageal junction to the antrum showed metastatic lobular breast carcinoma. Selected 2D left medial lateral oblique (MLO) image from the patient’s bilateral screening mammogram (Figure 1) shows a 5 cm area of architectural distortion in the upper left breast posterior depth. Left MLO DBT images (Figure 2), specifically slice 32, show the architectural distortion to be much more conspicuous in this patient with dense breast tissues. US of the left breast showed an ill-defined hypoechoic mass with posterior acoustic shadowing (Figure 3). Infiltrating lobular carcinoma of the left breast, with metastases to the left axilla and gastric wall. Differential considerations for architectural distortion include post-surgical changes/trauma and radial scar. Interestingly ILC has a propensity for metastases to the peritoneum, retroperitoneum, and gynecologic organs.5,6 The patient featured in this case had ascites with gastric metastases. DBT offers an advantage for evaluation of masses, architectural distortion, and asymmetries compared with conventional 2D digital mammography because superimposed tissue that confounds the clear depiction of a lesion on 2D mammography is out of the plane of focus with DBT. When compared with digital mammography alone, the combination of DBT and digital mammography has shown to increase cancer detection rate and decrease the number of false-positives. Lopez JK, Bassett L. Invasive Lobular Carcinoma of the Breast: Spectrum of Mammographic, US, and MR Imaging Findings. RadioGraphics. 2009;29:1:165-176. Singhai R, Patil VW, Jaiswal SR, et al. E-Cadherin as a diagnostic biomarker in breast cancer. North American Journal of Medical Sciences. 2011;3(5):227-233. Krecke KN, Gisvold JJ. Invasive lobular carcinoma of the breast: mammographic findings and extent of disease at diagnosis in 184 patients. AJR Am J Roentgenol. 1993;161:957–960. Newstead GM, Baute PB, Toth HK. Invasive lobular and ductal carcinoma: mammographic findings and stage at diagnosis. Radiology. 1992;184:623–627. Winston CB, Hadar O, Teitcher JB, et al. Metastatic lobular carcinoma of the breast: patterns of spread in the chest, abdomen, and pelvis on CT. AJR Am J Roentgenol. 2000;175:795–800. Harake MD, Maxwell AJ, Sukumar SA. Primary and metastatic lobular carcinoma of the breast. Clin Radiol. 2001;56:621–630. Stavros, A. T., Rapp, C. L., & Parker, S. H. (2004). Breast ultrasound. Philadelphia: Lippincott Williams & Wilkins. Zuley ML, Bandos AI, Ganott MA, et al. 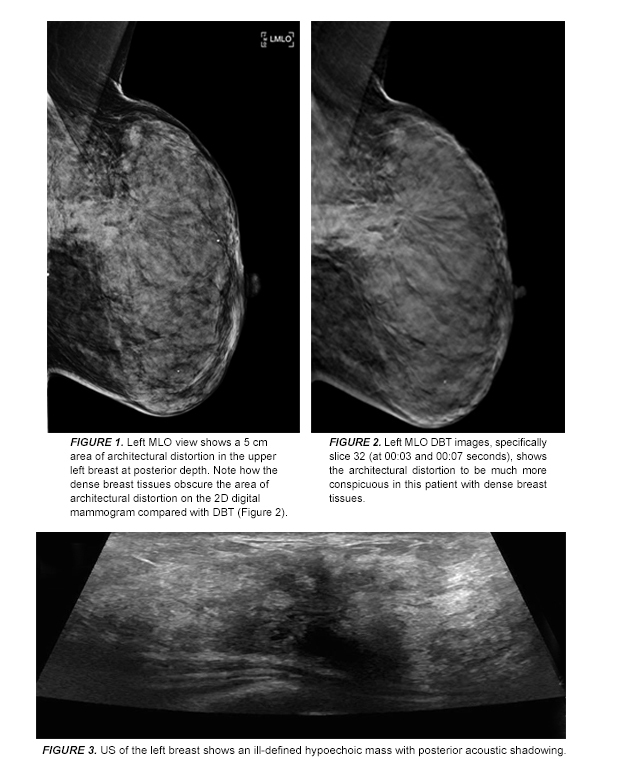 Digital Breast Tomosynthesis versus Supplemental Diagnostic Mammographic Views for Evaluation of Noncalcified Breast Lesions. Radiology. 2013;266(1):89–95. Skaane P, Bandos AI, Gullien R, et al. Comparison of Digital Mammography Alone and Digital Mammography Plus Tomosynthesis in a Population-based Screening Program. Radiology. 2013;267:1:47-56. Infiltrating lobular carcinoma of the left breast. Appl Radiol. Dr. Kapoor is a Breast Imaging Fellow, Department of Radiology, Baylor College of Medicine, Houston, TX and Dr. Huynh is the Medical Director, Women's Center, CHI Baylor St Luke's Medical Center, Houston, TX.